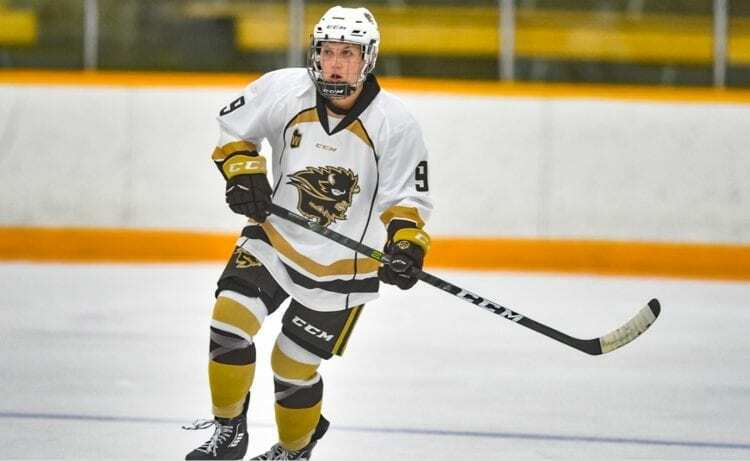 Having won a U SPORTS national championship with the University of Manitoba Bisons, Finnish superstar Venla Hovi has enjoyed the opportunity to remain in Western Canada. 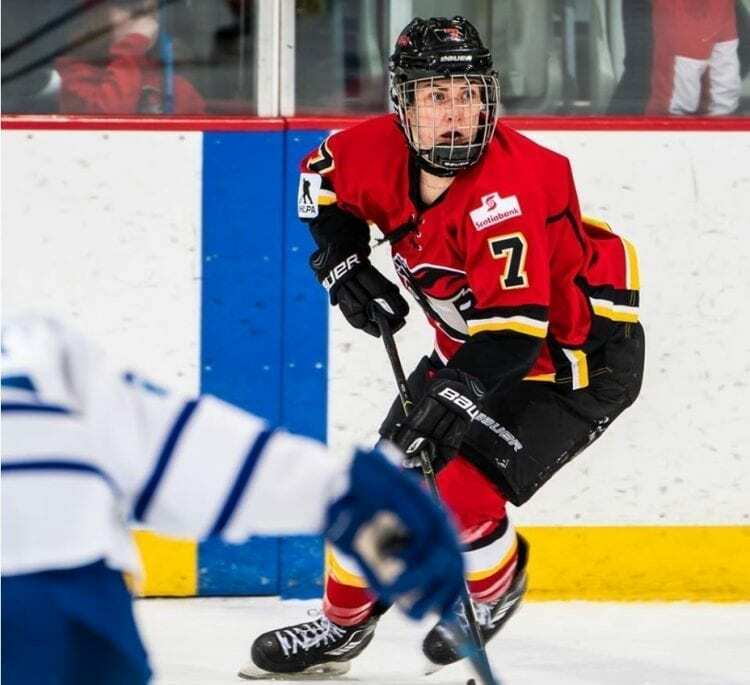 Donning the paraphernalia of the CWHL’s Calgary Inferno, the native of Tampere, Finland, who was also recognized as the Bisons’ Female Athlete of the Year for 2017-18, also boasts a pair of bronze medals from the Winter Games (2010, 2018). 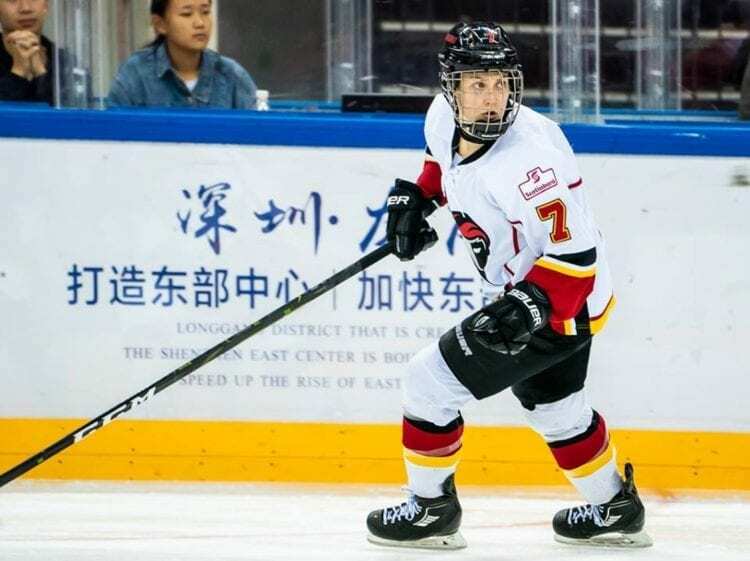 Part of a growing legacy of Finnish superstars that have played professionally in North America, she joins a celebrated sorority that includes Mira Jalosuo, who played for the Minnesota Whitecaps during their independent years. During the 2017-18 CWHL season, goaltender Noora Raty and Anniina Rajahuhta suited up for the expansion Kunlun Red Star. Both key contributors towards a run to the Clarkson Cup Finals, Raty also became the first European to capture Goaltender of the Year Honors. As a side note, Sari Krooks, who competed in the first Women’s ice hockey tournament at the Winter Games, back at Nagano 1998, also played at the Canadian university level, starring with Toronto’s York University in the late 1990s. Having turned 31 years young near the end of October 2018, Hovi is not a traditional “rookie”, as her hockey resume also includes a stint of NCAA hockey with the University of Niagara, along with starring in her homeland with HPK Hameenlinna. Her arrival to Calgary is certainly reminiscent of Russian legend Sergei Makarov, same age during his first season (1989-90) with the NHL’s Flames, which culminated in a Calder Trophy win. With a very respectable 14 points in 25 regular season games played, Hovi proved to be a highly dependable member of a roster filled with world-class players. In addition to a very solid plus/minus rating of +13, she displayed a very disciplined style of play, logging only four penalty minutes all season. Making her professional debut on October 13, 2018, as the Inferno visited Les Canadiennes de Montreal, such a match foreshadowed the magnitude of this epic rivalry. Worth noting, the final match of Hovi’s season pits the Inferno versus Les Canadiennes in the Clarkson Cup finals. With their third meeting in four years, it resembles the NBA Finals rivalry between the Golden State Warriors and Cleveland Cavaliers. Despite a -1 ranking in her debut, Hovi assembled a much better performance the following day, as a rematch versus Les Canadiennes resulted in her first career point. Merely 26 seconds into the second period, she would collaborate with Blayre Turnbull, registering the assists on a game-tying goal by Brianne Jenner. Later in the second, Inferno rookie Rebecca Leslie would record her first career goal, which also stood as the game-winner. 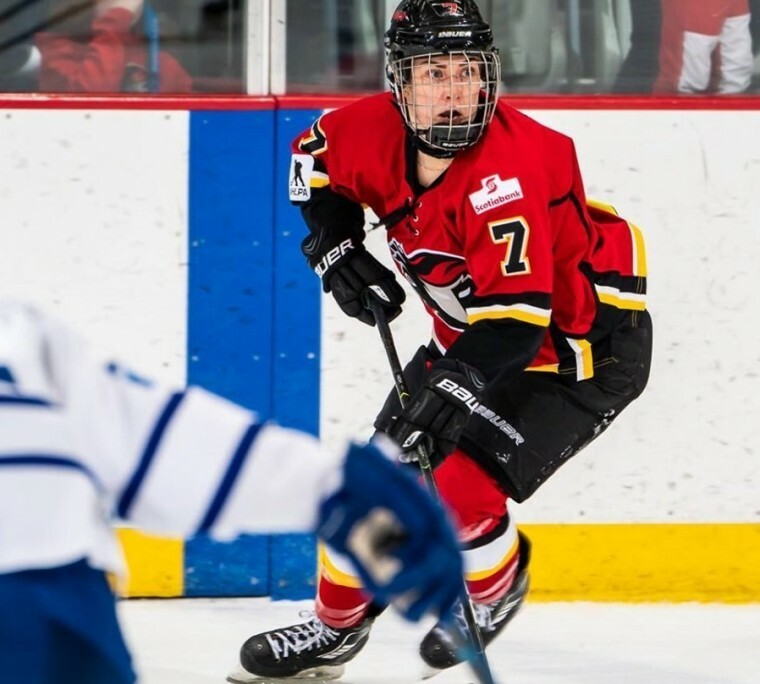 With the Inferno’s roster featuring Japanese star player Aina Mizukami, along with three celebrated gold medalists from the 2018 Winter Games, Americans Kacey Bellamy, Brianna Decker and Alex Rigsby, the presence of Hovi has transformed the Inferno into the league’s most cosmopolitan franchise, simultaneously shrinking the already small world of hockey. Statistically, it would not take long for Hovi to find her scoring touch. Of note, October 21 would see the start of a four game scoring streak, in which she amassed a total of six points, culminating on November 17. Among the achievements of said streak included her first multi-point performance, recording three assists in a 9-0 trampling of the Worcester Blades on October 28. Gaining a pair of assists in the second period, providing Calgary with a commanding 6-0 advantage, the feeling of playing alongside other world-class players was prevalent on this day. After assisting on a goal by Turnbull, Hovi’s second assist in the period resulted in collaborating with 2019 All-Star captain Brigette Lacquette, the first player of First Nations Heritage to compete in women’s ice hockey at the Winter Games. Both assisted on Dakota Woodworth’s first goal of the season, extending an already insurmountable lead. With less than a minute remaining in the contest, Hovi and second generation player Erica Kromm, whose father played for the NHL’s Calgary Flames, logged the assists on Brianne Jenner’s third goal of the season. Worth noting, rookie goaltender Annie Belanger gained a second straight shutout to start her career, resulting in the feeling of a shared milestone with Hovi. The streak also saw Hovi registering her first career goal, simultaneously tapping into her roots. An October 21 contest pitted the Inferno versus China’s Shenzhen KRS Rays. Scoring with 1:04 remaining in the second, it provided her team with a 3-1 advantage, as Jenner and Turnbull logged the assists. Teammate Aina Mizukami also scored her first goal in CWHL play. Gaining First Star of the Game honors, teammates Halli Krzyzaniak and Rebecca Johnston were the Second and Third Stars, completing an Inferno sweep. Yet, Hovi’s first goal brought with it a tinge of irony. 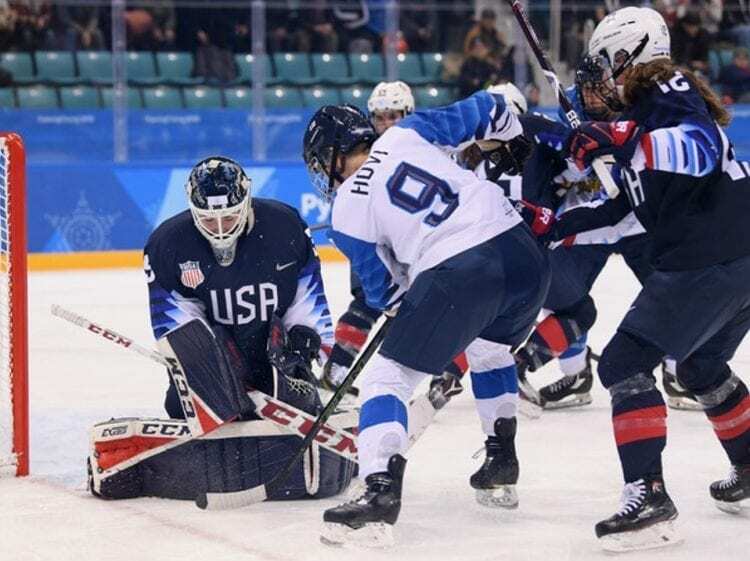 Scoring against Shenzhen backstop Noora Raty, both longtime members of Finland’s national team, having recently played together at the 2018 Winter Games, dynasty and destiny collided in a milestone that sees both intertwined. With Hovi’s inaugural sojourn into professional hockey resulting in travel to China and the United States, along with participation in a fundraiser for the highly admirable Do It for Daron Foundation, wearing the iconic purple heart jersey, such a series of highlights represent a rich narrative that encompasses what she has enjoyed most. Rather than looking at one key moment, she observes a bigger picture, indulging in the combination of jubilation and enjoyment, proud to call such accomplished women as teammates while relishing the team building and subsequent mutual respect. Culminating with qualification for the Clarkson Cup Finals, a proud milestone for any first year player in the league, it is the crowning touch to what has been a “dream” season. Hoping to join the likes of Katka Mrazova (Czech Republic) and Janine Weber (Austria) as Europeans that have won the coveted Cup, eager at achieving the dream of her name engraved on one of the most prestigious prizes of women’s ice hockey, Hovi already has a lot to be proud of. Taking on the roles of ambassador, playmaker and fan favorite with a decorous zest, it has enabled her to be a hockey hero on both sides of the Atlantic.